Definition: 1. AKSALA, Alaska, our largest state, spelled backwards. We think of it as the last frontier, the great land, God’s country. AKSALA Wealth Advisors, home of The Evan Guido Group, are retirement transition experts dedicated to offering you rising dividend equity investing. We target investments that are meant to help maximize portfolio performance so you can retire with confidence. 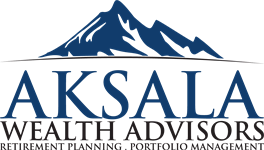 Run by President Evan Guido (contributor to the Sarasota Herald Tribune), AKSALA is your solution to a properly planned retirement.